Glasgow (AFP) - It was a perfect ten finish for Simone Biles at the world gymnastics championships on Sunday as the young American became the most decorated woman gymnast of all time on the final day of competition. The 18-year-old cooly added gold on the balance beam and the floor to the record third all-around and team titles she had already claimed at the Hydro Arena in Glasgow. 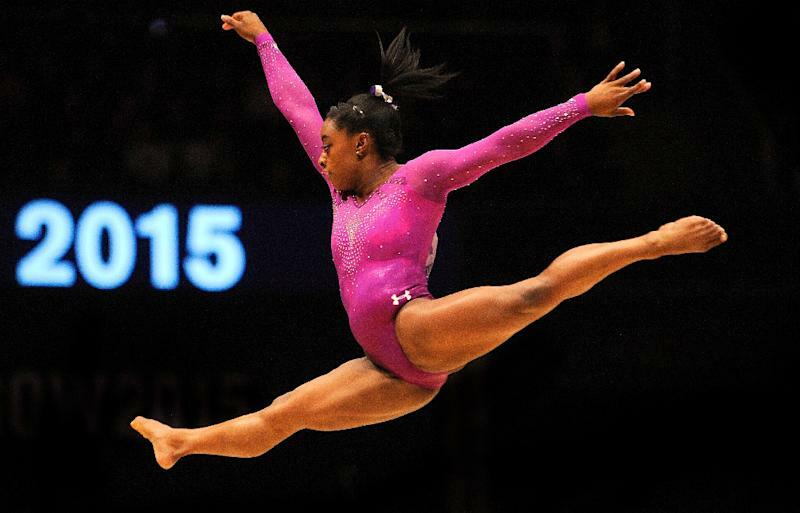 Biles' four world titles brought her tally to ten as the tiny Texan become the most-titled female gymnast in history. "It's a really amazing feeling and I don't think it has hit me yet. 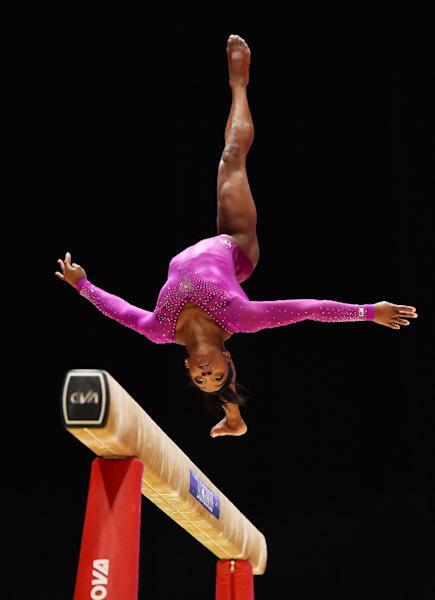 I can't even wrap my head around it," Biles said of her record. "I still don't believe my ability to achieve such things. It's crazy." It was the second straight worlds in which the teenager from Spring, Texas has won gold in the four events just over two years since making her senior debut in March 2013. 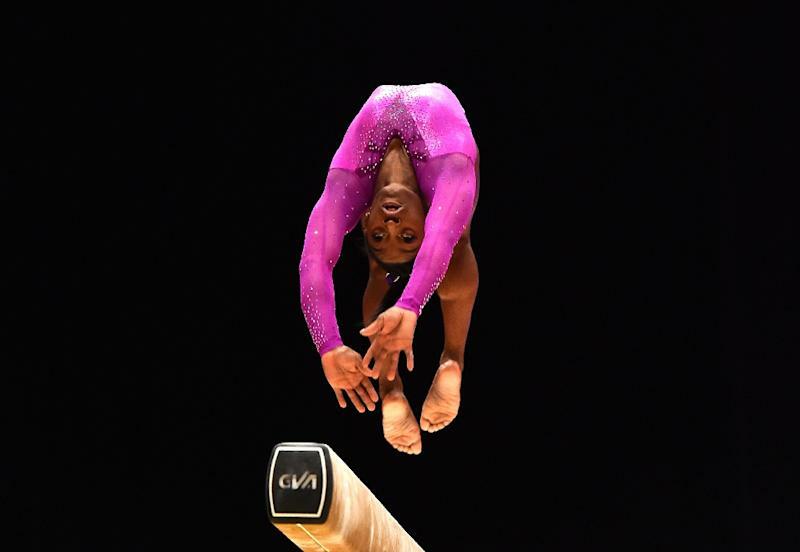 It has been a meteroic rise in just over two years for Biles who has become the first woman since Russian Khorkina to win three all-around titles and first to win three in a row after Antwerp in 2013 and Nanning in 2014. Khorkina won her first all-around title when she was aged 18 in 1997 followed by 2001, and 2003. And with less than a year to go before the Rio Olympics she is the overwhelming favourite to add to her tally in Rio. "It hasn't sunk in yet," said the 4ft 9in athlete with the infectious giggle. "It was one event to the next so I had to run back (after Balance Beam) and warm up. "Everything happened so quickly. It was pretty laid back because floor isn't that hard for me to warm up quickly. "Other than that, to switch gears that quickly is something we're trained to do, so it was OK."
On the beam she proved solid after a wobbly performance in the all-around final landing solidly with a double somersault to win by a 1.025 margin on Sanne Wevers of the Netherlands. And Biles' superior difficulty meant that once she had cleanly performed her rivals had no chance. Russia's Ksenia Afanasyeva, the 2011 champion, was the only gymnast who came close, finishing 0.700 behind, while Biles's teammate Maggie Nichols took bronze. Biles also got vault bronze this week to bring her career tally to 14 medals to put her in a tie for third with Latynina and behind only Khorkina (20) and Gogean (15). Biles has never competed in an Olympics, and will bid to topple teammate Gabby Douglas, the reigning all-around Olympic champion, who took two years off after the Games and returned to take silver behind Biles in Glasgow. It has been an incredible journey for the youngster born on March 14, 1997 in Columbus, Ohio. Biles moved to Texas at the age of three to be brought up along with her younger sister Adria by her grandparents Ron and Nellie Biles. The couple adopted the children after their mother Shanon Biles was struggling with drug addiction. Two other siblings were adopted by Ron's sister. Biles calls her grandparents Mom and Dad and both were cheering in the stands in Glasgow this week. She now dreams of one thing -- competing in the Rio Olympics -- where if she takes gold legend status awaits her. "Three years ago I would have thought they were absolutely crazy and wouldn't have believed it," said Biles of asked if she was now favourite for Olympic gold.